Subscribe to our newsletter for product offers and news! r3n33 on HR-OS1 at WCTD Creating STEAM Conference! Kyle on Introducing the Jimmy Research Humanoid! Joe Hubert on Introducing the Jimmy Research Humanoid! « The World Will End in a Robotic-Feline Uprising! The Phoenix Hexapod Comprehensive Kit is here! We’ve learned something over the past year: Roboticists from Norway can make some really awesome hexapods. We first met Phoenix Hexapod creator Kåre Halvorsen (who goes by Zenta on our forums) when he entered his amazing creation in our Project Contest. Needless to say, he won by a landslide vote. He went on to work with Lynxmotion and Jeroen Janssen (who goes by Xan on our forums) to develop a kit based version of his Phoenix with complete wireless PS2 control! 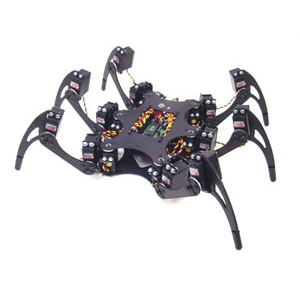 We are now proud to carry the Phoenix Hexapod Comprehensive Kit! This kit contains everything you need to build your very own wireless controlled Phoenix Hexapod. It even comes pre-programmed with Xan’s Wireless PS2 controller program. Words can’t describe how amazing this robot is, you really have to see it in action so check out the video below! This entry was posted on Thursday, November 20th, 2008 at 4:03 pm	and is filed under Front Page News, New Kits / Products, Product Spotlight. You can follow any responses to this entry through the RSS 2.0 feed. You can leave a response, or trackback from your own site.